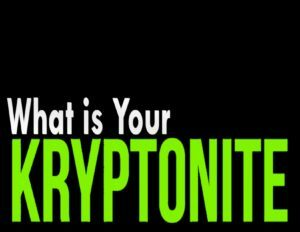 Our question for you: What is your Kryptonite? Everyone knows Superman. He was unreal. He had so much strength, so many super powers. Faster than a speeding bullet. More powerful than a locomotive. X-ray vision. Inferred eyes. Nothing could stop him except, kryptonite. Kryptonite was the one thing that stole his strength. God has given you the righteousness of Jesus [2 Corinthians 5:21]. When you accept Jesus into your life, scripture tells us God pours the goodness and righteousness of Jesus into you. That means every time God sees you, He doesn’t see sin or failure, God sees the righteousness of Jesus in you. God has placed the Holy Spirit inside you as a guarantee that He is with you [Ephesians 1:14]. God told us that the Holy Spirit is His guarantee that He is with us today and into the future. The Holy Spirit is God, part of the trinity, God the Father, the Son and the Holy Spirit. God is literally putting God into you. Think about all that. That’s God’s strength given to you. Grace. Righteousness. The Holy Spirit. It makes us spiritual Supermen, Superwomen. Quick question. How many people who attend church do you know that live like that? As amazing as all that is, the one thing that will steal our spiritual strength is sin. Sin is our kryptonite. As we learn what it means to be a disciple of Christ, to live in freedom, we will face a battle. Primarily, the battle will always be in our mind. We will always have to believe that truth of what God gave us while at the same time struggle to live in this world. We will struggle with sin, negative emotions or thoughts. When you come to God, confess your sins or declare your need Him, God is there for you. And yes, you might struggle with sin, negative emotions or thoughts. That’s reality. That doesn’t mean you are failing, that means you are in a battle. We said maybe your kryptonite is feeling like you are not free, but the truth is, you really are. Maybe your kryptonite is thinking it takes too long, but the truth is, it’s perfect timing. Maybe your kryptonite is believing that because you struggle, you have failed, but the truth is, you are in a battle. All this means, we live every day and believe that God placed His strength inside of us [His grace, His righteousness, His Holy Spirit]. It’s called faith. Faith means, I believe God will protect me and provide for me. I give God control of my life. I surrender my right to demand that life be about me. It’s now about God and what He is doing. I no longer have to control or manipulate people or circumstances to be make things the way I want them to be. I want to read for you how God views faith. In the scripture I am going to read to you, it’s a story about the nation of Israel. They were being attacked by Assyria. The nation of Israel was rightfully scared. The Assyrian army was horrifying the way they treated people. What Israel didn’t do was turn to God. They didn’t pray. They didn’t ask God for help. Instead, they took matters into their own hands. They did what seemed to make sense. They went to Egypt to make a deal. At that time Egypt was a strong military nation, so it seemed to make sense that Israel would start negotiating with Egypt for help. This is what God said. “Doom, rebel children! “GOD’s Decree.” You make plans, but not mine. You make deals, but not in my Spirit. You pile sin on sin, one sin on top of another, 2 Going off to Egypt without so much as asking me, running off to Pharaoh for protection, expecting to hide out in Egypt. 3 Well, some protection Pharaoh will be! Some hideout, Egypt! 4 They look big and important, true, with officials strategically established in Zoan in the north and Hanes in the south, 5 but there’s nothing to them. Anyone stupid enough to trust them will end up looking stupid – All show, no substance, an embarrassing farce.” …7 Egypt is all show, no substance. My name for her is Toothless Dragon. What did God say? You didn’t have faith in me. You had faith in Egypt and their army. Do you see it? Faith. I live everyday believing what God said about me [His grace, His righteousness, His Holy Spirit]. I believe God will protect me and provide for me. I give God control of my life. I surrender my right to demand that life be about me. It’s now about God and what He is doing. I no longer have to control or manipulate people or circumstances to make things the way I want them to be. As we walk in faith, we need to understand God’s goal for us. God wants us to grow up. He wants us to develop character. He wants us to be holy. Notice, God’s goal is not for us to be happy all the time. We must know that Christianity isn’t about living out some weird idea that we live in the fairy land of happiness with rainbows and unicorns and when it rains, it only rains M&Ms. It’s not about prosperity, about God giving you the American dream of safety, comfort and success. Christianity is about growing up in character and holiness and sometimes that means we must walk through hard times. 3 Everything that goes into a life of pleasing God has been miraculously given to us by getting to know, personally and intimately, the One who invited us to God. The best invitation we ever received! 4 We were also given absolutely terrific promises to pass on to you – your tickets to participation in the life of God after you turned your back on a world corrupted by lust. 5 So don’t lose a minute in building on what you’ve been given, complementing your basic faith with good character, spiritual understanding, 6 alert discipline, passionate patience, reverent wonder, 7 warm friendliness, and generous love, each dimension fitting into and developing the others. 8 With these qualities active and growing in your lives, no grass will grow under your feet, no day will pass without its reward as you mature in your experience of our Master Jesus. 9 Without these qualities you can’t see what’s right before you, oblivious that your old sinful life has been wiped off the books. Notice what God wants for you. Character. Holiness. Notice that nothing can stop you from growing. You can develop as much character and holiness that you want. Notice that this is available for everyone. There are no requirements to have character or be holy. You don’t have to be rich, gifted, pretty or super smart. Before we move on, two things. As we live a life of faith, we will have a battle, in our minds, to always remember the strength God gave us [His grace, His righteousness, His Holy Spirit]. And at the same time, we live in this world and will struggle. Secondly, as we live a life of faith, God’s goal for us is not 24/7 happiness, it’s bigger than that, it’s character development. Holiness. That means, life will be hard at times because that is what develops character and holiness. So, faith matters as we walk through hard times. Let’s do a quick eight question test that will reveal your faith. It will reveal what you believe. Now a quick follow up question. Do any of your answers depend on people or circumstances? For example, I would be happy if my spouse was better or if my kids would do what I say? If they do, chances are you experience frustration in life because you require other people and circumstances to do what you want to be successful, significant, fulfilled, satisfied, happier, have more fun, feel more secure and be at peace. Do you see how defeating that way of living is? Chances are, to find happiness, you need to control or manipulate people or circumstances to be happy. Notice, God’s goal for you is to grow in character and holiness. If all your answers were about God growing you, nothing could stop you from being successful, significant, fulfilled, satisfied, happier, have more fun, feel more secure and be at peace. Let’s make this even more practical. Why do we get angry? Normally, it is because someone or something is blocking what we want. Examples: My goal in life is to have a loving, supportive and happy family. Who doesn’t want that? The problem is everyone in the family can block that goal. Or, my goal as a pastor is to reach all of my community for God. What pastor doesn’t want that. The problem is everyone in the community can block that goal. Maybe we need a goal that isn’t based on people or circumstances. Examples: My goal as a father or mother is to be the best parent I can be. No one can stop that goal. Or, my goal as a pastor is to love and impact people the best I know while they are at church. No one can stop those goals. Why do we feel stress and anxiety? Normally, it is because I am not confident in getting what I want. Examples: How do we pay for braces, sports activities and college? I now stress and feel anxiety over money. How can I guarantee my kids will find good friends, the right teacher and a great youth group? I now stress and feel anxiety over my kid’s life. Maybe we need a goal that isn’t based on things we don’t control. Examples: My goal is to work, budget and save and do all I can with money so in the future we will look at our options. Or, my goal is to be a proactive, loving and engaging parent with my child as they walk through life. No one can stop those goals. Why do we feel depression? Normally, we feel defeated and think, what I want will never happen. Examples: 1. If I am a good Christian, my spouse or child will learn to love God. 2. If I am a good Christian, I will never be discouraged. 3. I don’t think my life will ever work out the way I want. In those examples, if they don’t happen, I feel hopeless and overwhelmed. Maybe we need a goal that isn’t based on things we don’t control. Examples: 1. My goal is to love my spouse and children. It’s the Holy Spirit’s role to open their hearts to God. 2. My goal is walk with God as I feel discouragement. 3. I will walk with God one day at a time. What is your kryptonite? What is stealing your strength? Are you angry at someone, God or life because they are standing in your way of what you want? Maybe your anger is your kryptonite and it’s stealing your spiritual strength. Are you walking with stress and anxiety, not sure if you will get what you want? Maybe your stress and anxiety is your kryptonite and it’s stealing your spiritual strength. Are you walking in depression because you think, what you want will never happen? Maybe your depression is your kryptonite and it’s stealing your spiritual strength. Here is what we do. Focus on becoming who God asked you to be. No one can block that from happening. Focus on living life one day at a time and place your future into God’s hands. Don’t have a goal based on something you can’t control. When anger, or anxiety, or depression pops up, ask yourself why? Sometimes is for reasons that make sense. Sometimes it’s because we have wrong goals. Faith means, I live everyday believing what God said about me [His grace, His righteousness, His Holy Spirit]. I believe God will protect me and provide for me. I give God control of my life. I surrender my right to demand that life be about me. It’s now about God and what He is doing. I no longer have to control or manipulate people or circumstances to be make things the way I want them to be. Walk through those eight questions again. What do you believe you need to do to find success, be significant, fulfilled, satisfied, happier, have more fun, feel more secure and be at peace? Are your answers based on people or circumstances or on God?